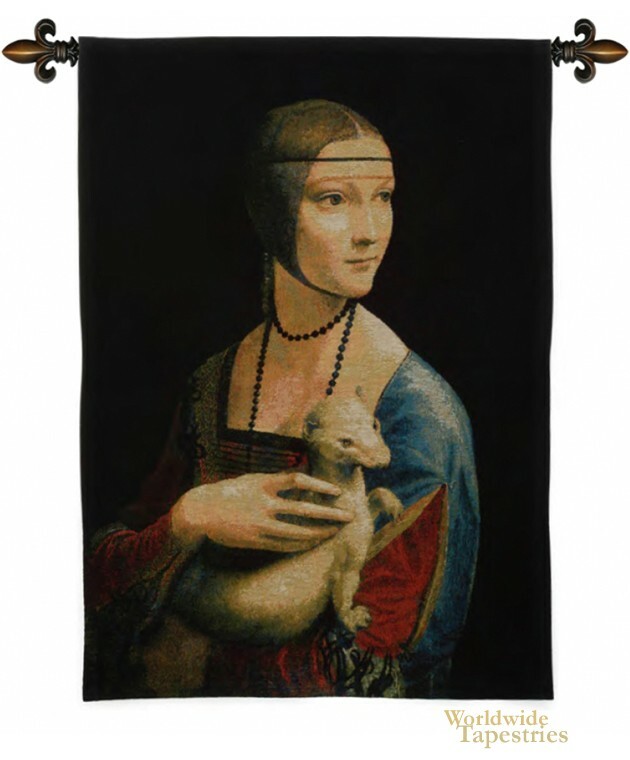 Dame A L'Hermine Belgian tapestry is based on the gorgeous work by Leonardo Da Vinci from 1489. The subject is Cecelia Gallerani and with Mona Lisa and 2 others, is one of only 4 portraits of women by da Vinci. Hermine refers to a type of weasel and is a symbol of purity. Gallerani was the mistress of da Vinci's employer at the time Ludovico Sforza. As will the works of da Vinci, we see the masterful use of composition and color, with the lady looking away from the viewer, and yet is captivating with her expression. This Renaissance tapestry is backed with a lining and a tunnel for easy hanging. Note: tapestry rods and tassels, where pictured, are not included in the price.